Here are two recipes for curried carrot soup, one is raw (but can be warmed if desired), suitable for breaking a fast; the other is cooked. Both are creamy and rich with spices and good fats (avocado, coconut). 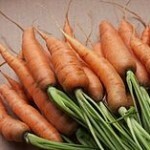 Note that I have other raw carrot soup recipes on this site, but they are not curried. Ginger – especially raw ginger root – is an amazing spice with many nutritional and healing benefits. And, if you have a spice grinder, I highly recommend grinding and mixing your own curry blend. See my post: Curries & Blends for ideas. This makes one serving. When I made this the first time, I was coming off the fast and could not yet add dairy. But if you can have dairy, yogurt is a wonderful addition. Or add almond yogurt. You make your own curry spice mix for this recipe; alternately, you can use a commercial curry mix. See Herbs & Spices: Curries for more. Shred carrots (or make juice). Remove seeds from bell pepper; cut into large chunks. Chop onion, mince ginger and slice celery. Remove avocado from shell and chop coarsely. Place all in blender. Add lemon and apple juice, and yogurt (if using). Process until pureed, adding water as needed for desired consistency. Add spices and taste, adding more spices and blending again until desired flavor is reached. This recipe is adapted from Extraordinary Health magazine, Volume 9 (1), and serves 2. The magazine included this recipe in an article titled “Inflammation Cooling Recipes.” In this case, several of the ingredients fit this bill, including onions, ginger, and the spices in a curry blend. The original makes a big batch, serving 6 or more, but I’ve halved it to serve 3 – 4. It can be served chilled or warmed. It’s best to use freshly ground mustard and coriander seeds, but commercially-ground seed can be used in a pinch. If you have a spice grinder, I highly recommend grinding and mixing your own curry blend. See my post: Curries & Blends for ideas. Peel and slice carrots. Chop onion. Mince ginger root. Grind coriander and mustard seeds to powder; combine with curry powder and minced ginger. Zest the lime, then squeeze the juice. Melt coconut oil over medium heat in a large soup pot. Add ground coriander and mustard seeds, curry and minced ginger. Stir one minute until fragrant. Sprinkle with sea salt and ground pepper. Add onions and sauté until slightly soften. Add broth and sliced carrots; cook over medium-low heat for about 30 minutes, or until carrots are tender. Cool a bit. Then, working in batches, puree in blender until smooth and return to the pot. (or use immersion blender). Stir in lime zest & juice, and adjust seasoning to taste. Ladle into bowls and garnish with yogurt. This entry was posted in Citrus, Fat or oil, Herbs, Onion family, Root Veggie, Spices, Stock, broth, Stone fruit and tagged almond yogurt, apple juice, avocado, bell pepper, carrot, cayenne, celery, chicken broth, cinnamon, coconut oil, coriander, cumin, curry powder, ginger root, lemin, lime, mustard seed, nutmeg, onion, turmeric, veggie broth, yogurt. Bookmark the permalink.